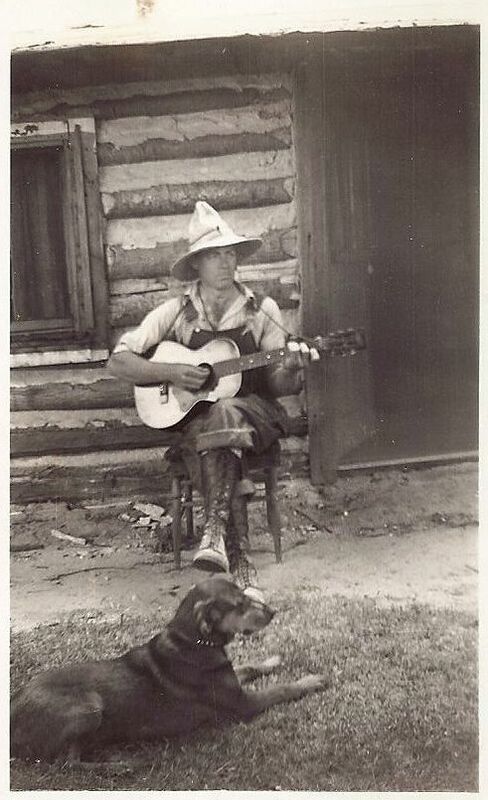 My Grandpa in 1938, playing his guitar in front of the log cabin that he and my Grandma lived in as newlyweds. Brownie his dog listens, enjoying the music. Every year, on the fourth Saturday in September, we attend a Fall Festival held by one of the small towns in our area. It’s such a simple event. Sometimes we laugh because there is so little to do there, but we love it. We like the quietness, the slowness, like we’ve briefly stepped back in time. We walk along and look at the tractors and the small hit and miss engines that are on display. Then stand and watch the cast iron, campfire cooking. After we get our fill of smoke, we wait our turn to go on the horse and wagon ride. The highlight of the day is the dulcimer band, though they play more than just dulcimers. There are other instruments, like the spoons, penny whistle, guitar, upright bass, and mandolin. The same musicians come every year and every year they play the same songs. 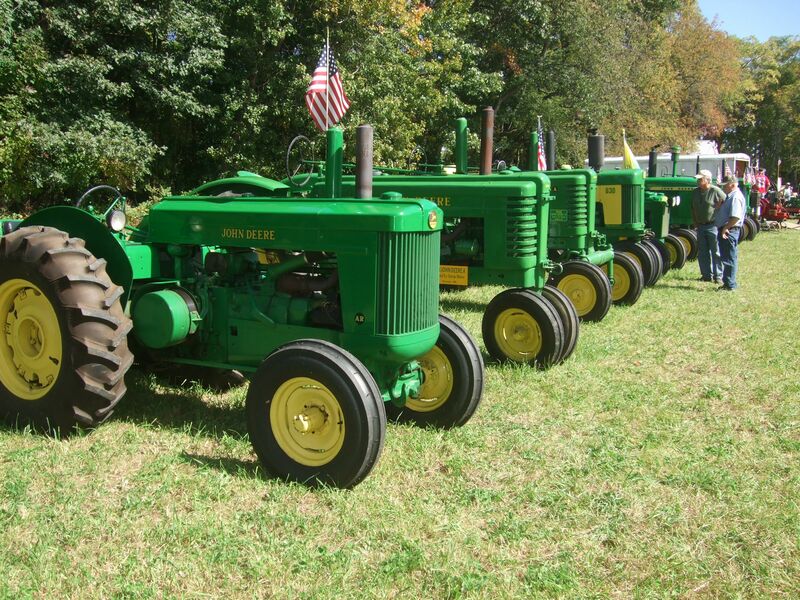 Tractors on display at the Fall Festival. The Fall Festival starts at 11:00am. We always arrive around that time, with a picnic. We bring the old “Indian blanket” and lawn chairs and sit, eating our lunch, in the shade of the big, Wild Cherry trees. I had talked with Amy the day before about what we were bringing to share for our picnic lunch. I told her I’d bring some cupcakes. 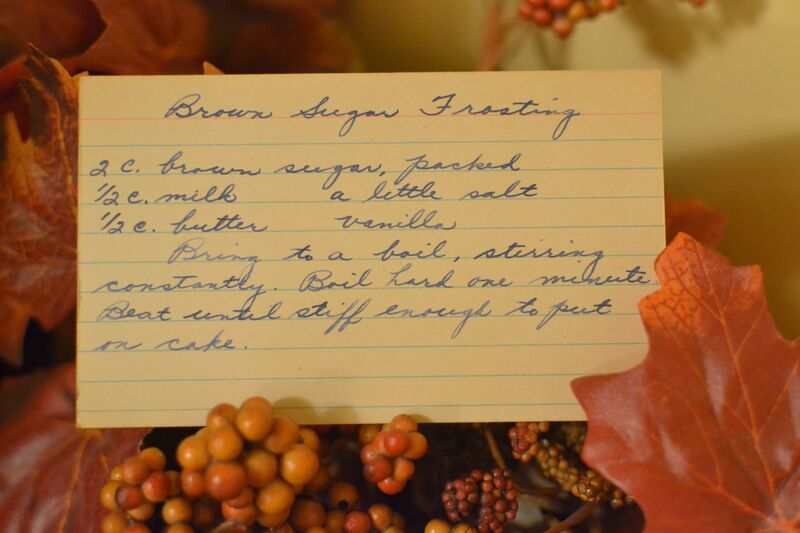 I’d been dying to try my Grandma Dora’s Brown Sugar Frosting recipe that I’d found leafing through her box. It sounded “fallish” and what better place to try it, but at our annual Fall Festival outing. Bring all ingredients to a boil, stirring constantly. Boil hard for one minute. 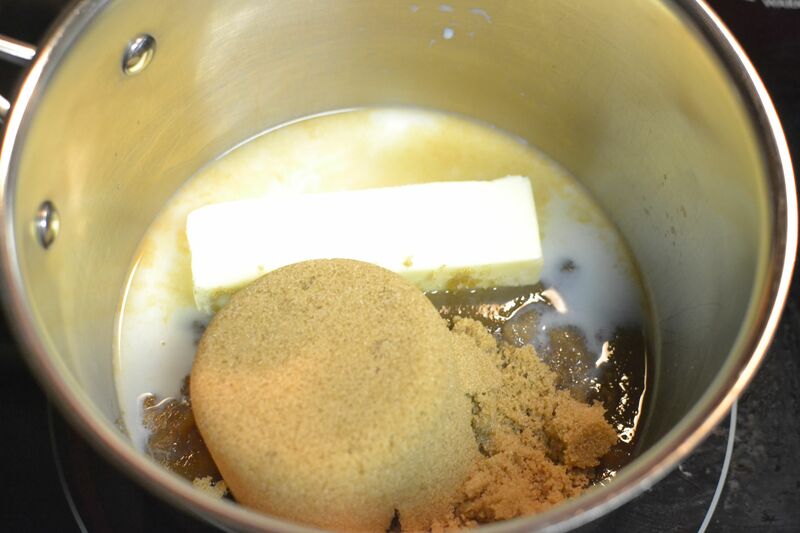 Beat with mixer until stiff enough to put on cake, about 3 minutes. Frost cake while frosting is still warm so it spreads easily. 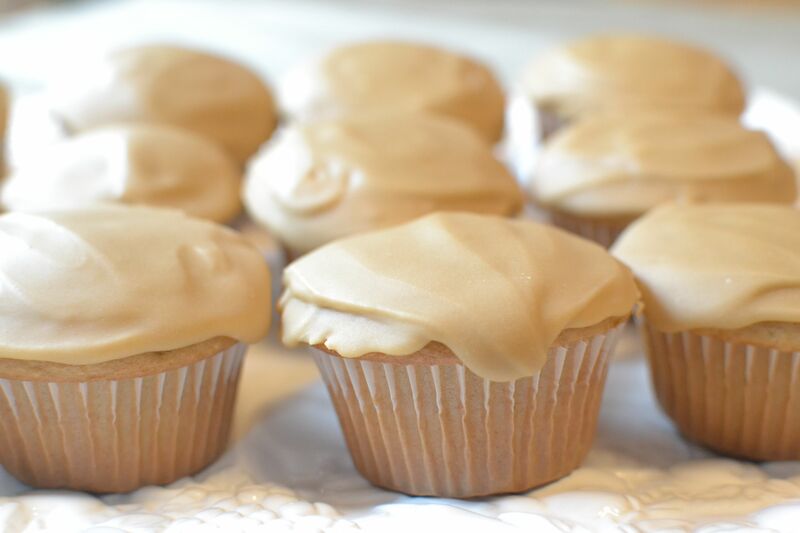 I had already made my cupcakes, caramel flavored, which seemed like they’d make a perfect taste combination with Brown Sugar Frosting! I gathered my ingredients and got started. I simply measured all of the ingredients into my saucepan and began heating it up on the stove top. Soon everything was melted and mixed together. I raised the temperature and while whisking constantly, brought it up to a hard boil. Once boiling, I timed it for one minute. Wait until you smell this while it’s cooking. If you’ve ever been to Mackinac Island, this smell will take you back! — NO, it doesn’t smell like the horses!! It smells like the rich, sweet fudge shops with the sugary, caramelized scent that pulls you right in their front doors! Our house smelled wonderful! With an aroma like that, I knew the taste had to be incredible! After it was done boiling, I removed it from the heat and poured the hot syrup into my Kitchenaid. 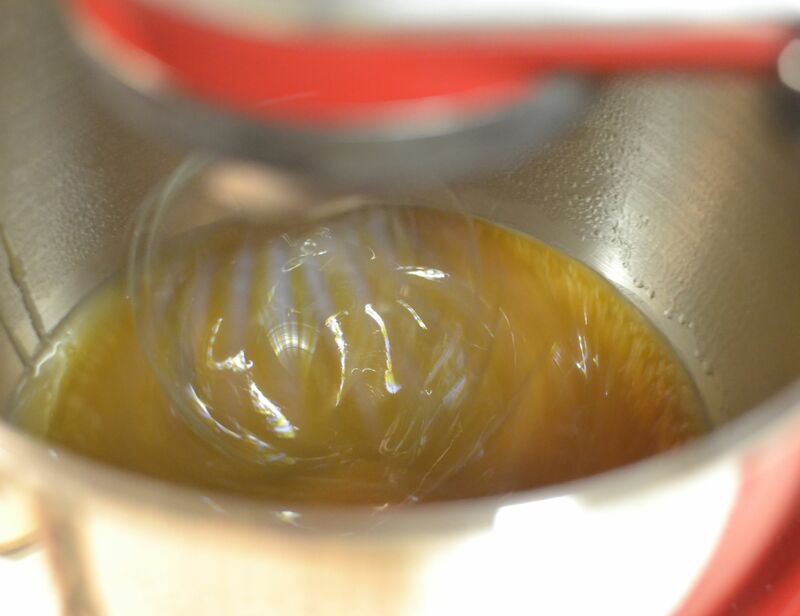 I used my whisk attachment and beat it on the highest setting for about three minutes. 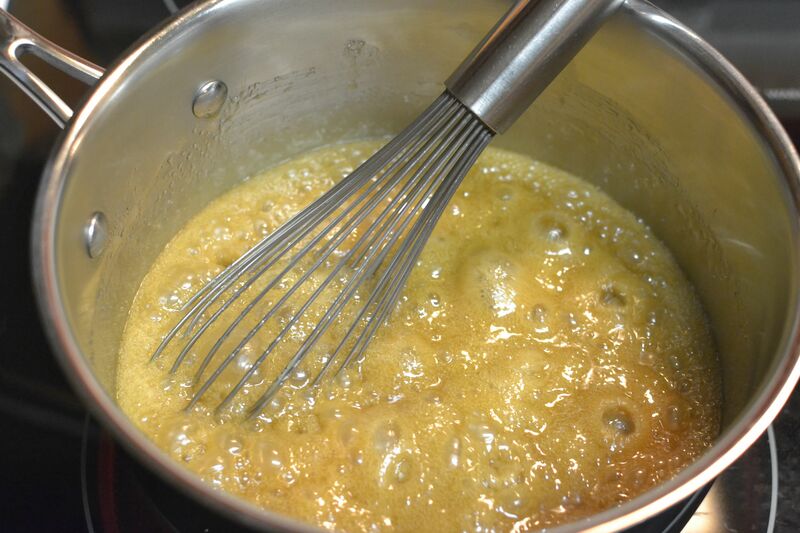 At that point, the syrup was beginning to thicken. 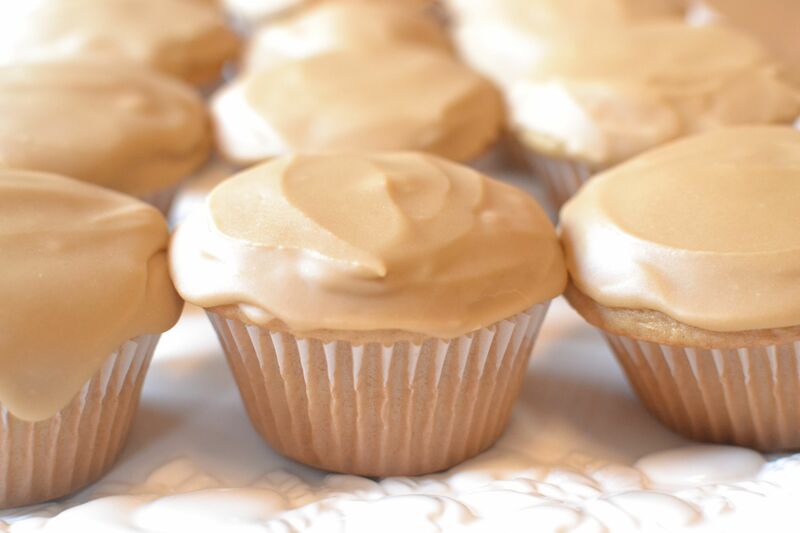 I knew that it would get even thicker as it cooled, so I turned it off and let it sit at room temperature for a few minutes while I got my cupcakes ready to frost. It was late when I was frosting the cupcakes that night. Our boys were in bed and my husband was in reading. I was thinking and quietly frosting them in the calm. After some dripped off of my spatula, onto the table, I tasted it. As I licked my finger, I shouted out, “OH BABY!” which my husband later teased me about, but I couldn’t help it, it was just THAT good! This frosting is kind of delicate. I had to frost my cupcakes when it was at just the right temperature. If it cooled too much, it got rather fudge-like. (Not that it was a bad thing, but it was harder to spread.) I frosted the cupcakes when the frosting was still warm and it went on smooth and hardened with a beautiful, glossy sheen! A couple of times, I could tell that the frosting was cooling and thickening too much, so I popped it into the microwave, for less than 5 seconds to thin it back down. It worked perfectly! 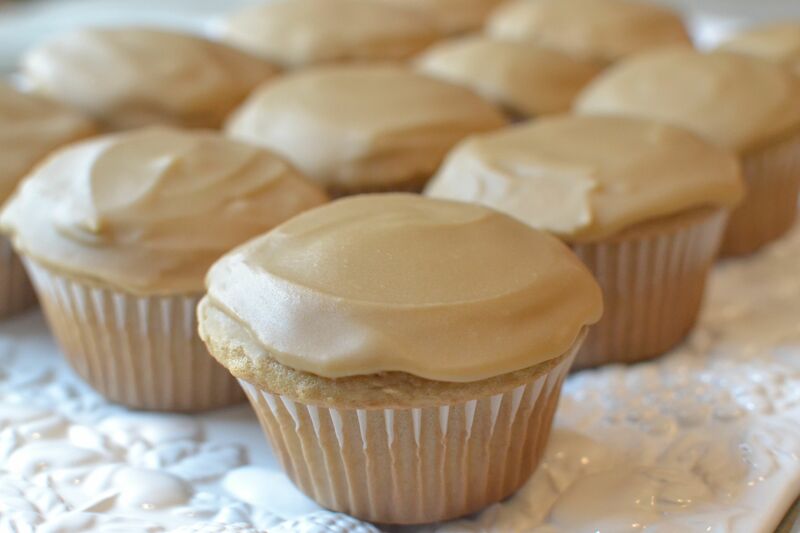 Decorating the top of a cupcake, Brown Sugar Frosting looks simple and old-fashioned, but there’s absolutely nothing simple about the taste! 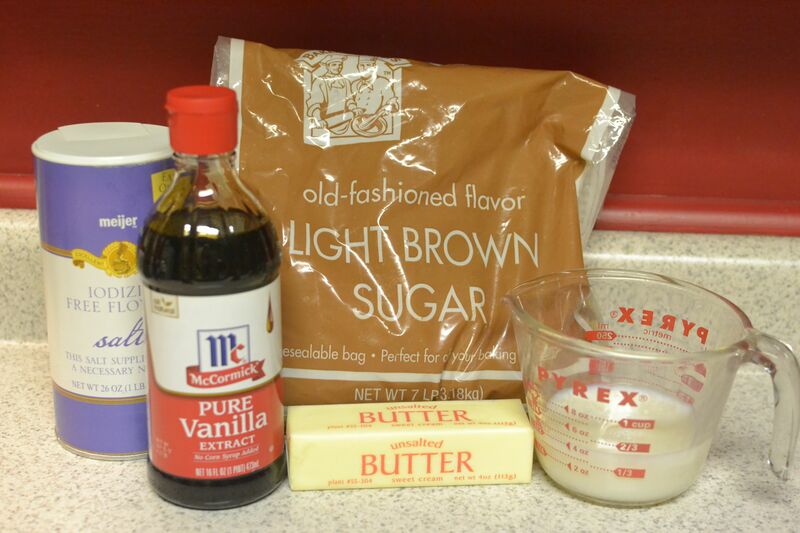 This entry was posted in Cake, Frosting and tagged baking, brown sugar, brown sugar frosting, dessert, frosting, grandma's cooking, homemade, Kitchenaid, scratch cooking by GrandmothersRecipeBox. Bookmark the permalink.